My food processor was no match for that chunky parsnip! I am not a big fan of masking vegetables. I remember when Jessica Seinfeld’s book, Deceptively Delicious, came out. I just scratched my head in wonder because you don’t have to deceive your kids to get them to like vegetables (amazing what salt, pepper and a bit of olive oil can do there… not to mention garlic, carmelized onions, and so forth). Figuring out creative ways to use up a surfeit of the same vegetable is a challenge, regardless of how much you may like the vegetable in its purest form. Today I set out to use up a bunch of carrots (bunch being more than a “bunch” of carrots, as in a couple of weeks’ worth piling up in the depths of my crisper drawer) and the end of the eggplant. My solutions? A couple of puree/dips: Sweet creamy carrots and Baba Ganoush. 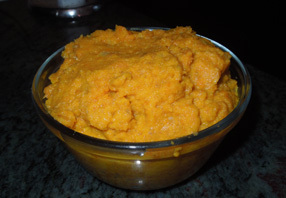 I’d made pureed carrots before, but I struggled with the recipe this time around. In part, this was my own fault for having a really busy weekend. I boiled the carrots (adding in a parsnip, which as it turns out was not one of my smarter decisions… more on that later) yesterday and tried to puree them today. The butter was hot, the carrots were cold. I’m sure you know how that ended up (hint: not in the food processor). I had to return everything to the stove to reheat and ended up using a hand-held mixer to puree with less than perfect results. If I had commercial-grade equipment, I may have fared better. As it was, the parsnip perniciously refused to puree! After taking way more effort than I should have (oh, well, at least I can scratch exercise off my “to do” list for the day! ), I finally pulled the chunks of parsnip out and diced them with a knife. In the end, the carrot-parsnip mix tasted really good, but there were chunky bits that weren’t there the first time I made this dish several years ago. 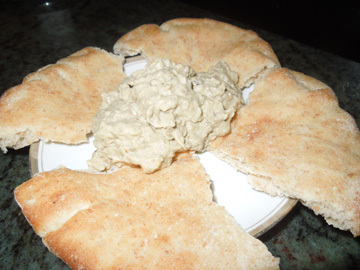 Baba Ganoush with Baker’s Bounty whole wheat pita. Yummy! Ironically, it was my first time making Baba Ganoush, which turned out perfectly to my taste. 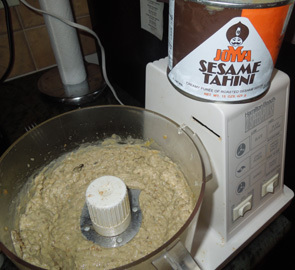 I do think that both garlic and tahini can be very personal in nature (I like the spicy more than the nutty), so the recipe has a range on both. The time it took to make the eggplant dip was minimal, and this time my food processor worked fine. My only problem is that I may eat all of it in a single sitting. It’s that good! Chop the carrots and parsnip into 1-2″ chunks and boil in salted water until tender. 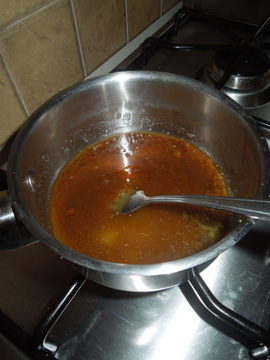 Melt butter and stir in brown sugar until dissolved. 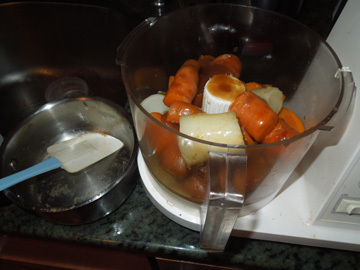 Transfer softened carrots/parsnip and sugar mixture to a food processor. Blend until creamy, adding in honey, cream and water as necessary to keep mixture moist. Serve hot or cold as a side dish. Preheat oven to 400. Remove stem top and prick side of eggplant with knife. Roast garlic on a tin-foil-covered cookie sheet 20-40 minutes depending on size of eggplant; turn half-way through baking. 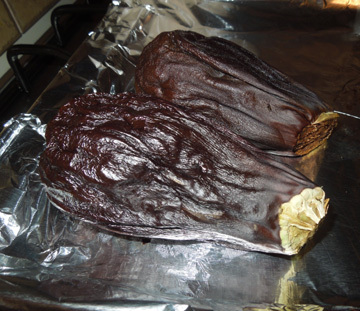 If you prefer a “smoky” taste to your Baba Ganoush, cook eggplant over an open flame (outdoor grill) until skin is black and eggplant is mushy. Wait for eggplant to cool to your touch. Skin should peel off easily. Cut soft eggplant into chunks and add to food processor along with remaining ingredients. Blend only until mixture is still chunky. Garnish with parsley, olives or pimento. Serve warm or chilled with pita bread wedges.